Every now and then history throws up great men who seem to be just right for the age. 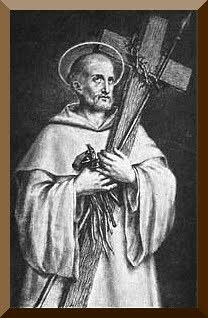 Such a man was St Bernard who has been given an honorary title of ‘The Last of the Fathers,’ probably because of his great devotion to Mary. Here Bernard shows Mary to be the bride that the writer of the Song of Songs talks about. In this case Mary represents the whole church as bride of Jesus. Bernard saw so much depth in the work and life of Mary. Bernard was also one of the first people the claim that Mary was the Immaculate Conception. Although this doctrine was held in common devotion it was not officially taught by the Church. The Cistercian Order had been founded in 1098 just eight years after Bernard was born. In the beginning it was struggling but after Bernard joined with a group of relatives and friends and the Order grew rapidly. He was made an abbot after three years in the monastery and during his life he founded 65 monasteries. He was also great friends with a local man here; St Malachy of Armagh. When St Malachy was coming home from Rome in 1148, he stopped off to visit Bernard at his monastery. Malachy died while there and Bernard put his habit on Malachy and buried Malachy in his own grave. They were great friends. Bernard also sent a group of monks to Ireland to found the first Cistercian monastery here in 1048 at Mellifont in Co Louth.